I practice Traditional Taekwondo. And it looks like Karate. So when my online buddy Charlie from Bunkai Jutsu came up with a post What's the Difference Between Karate & Tae Kwon Do? (Part 1), I was happy to review it and give him my two cents worth. I'd agree that Karate and Tae Kwon Do are "related styles". 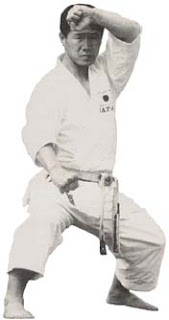 The founder of Taekwondo Gen Choi Hong Hi plus a number of other pioneers were all Korean Karate trained. What I like to think however is that the Karate they practiced in Japan in the 1920s and 1930s was a fairly rigid system focusing on kihon and kata. 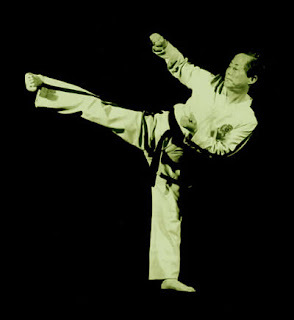 Early Taekwondo loosened this rigidity up, improving mobility, and introducing the kick as a long range weapon. What I like about Karate is not so much that it "primarily focuses on hand techniques with the legs as backup," I like it because the legs are an alternate weapon to hands. I reckon that a decent Karate practitioner would be devastating when you (or your girlfriends) step within reach or if you lay your hands on any part of his body. The whole body is the weapon! I think the lesson to learn from both is that there is that need for mobility, and then there's the need for being grounded. If you think of it this way, having a higher stance may be more appropriate if you're further from the target, and it's better to drop your COG when you're closer to your opponent. I would also add that having a high COG allows you to use weapons more in line with modern sparring contests - jabs, crosses, and quick uppercuts. Nothing wrong with those tools! Being grounded however allows you to access more traditional striking techniques. 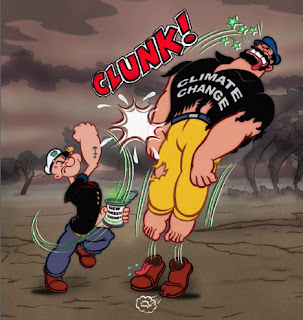 And I would never say that Karate-ka have less efficient kicks - I value the range of powerful short-range basic kicks in combat over any 360 jumping combo. Please visit his article and then the follow up What's the Difference Between Karate and Taekwondo Part 2 and tell me what you think. And you might want to check out another of my articles The Problem with Hard Styles Systems like Taekwondo and Karate. Well done Vaungh for having the strength to pull yourself out of a hell that traps many people for their whole life. Well done also for having the courage to speak about it openly and publically, which will help others to realise that they are not alone. A real man does not fight WITH his family, but he will fight FOR them. A real man provides a safe haven for his loved ones to be nurtured, and to grow spiritually and mentally. A man that undermines his own family, is not a real man at all. Short range versus long range... You've put a bee in my bonnet now, Colin.